This weekend sees the opening of Somerset Art Weeks, a two-week-long visual art and crafts festival with a micro-tasting feast of locally-sourced foods. 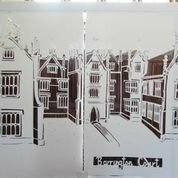 Barrington Court is a sixteenth-century Tudor house with no furniture; a fact that poses an interesting challenge for the National Trust regarding its use as a visitor attraction. A circumstance, also, that makes it an extremely attractive proposition for contemporary art and craft exhibitions. With this in mind, Carol Carey, Development Manager for Somerset Art Works (SAW) proposed an exhibition of contemporary craft for the historic property that was rescued from ruin in the 1920s. 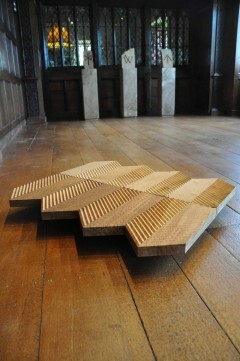 As part of the two-week-long visual art and crafts festival that sees artists exhibiting their work in a range of venues throughout the county, Tom Freshwater from the National Trust, SAW have delivered Make the Most – an ambitious commissioning project that features as the main exhibition for this year’s Somerset Art Weeks. Curated by Craftspace’s Deirdre Figueiredo, Make the Most presents five internationally-renowned craft artists who have filled the property with specially commissioned works. Laura Ellen Bacon, Maeve Clancy, Thomas Appleton, Gary Allson and Laura Youngson Coll have each been paired with specialist suppliers and producers from Somerset. The Old Kitchen and Great Hall are adorned with Bacon and Clancy’s impressive large-scale installations that use willow and paper respectively. Continuing the inescapable theme of gardening, Youngson Coll’s intricately made leather plants and lichen-covered gloves are thoughtful tributes to the ‘the intuitive knowledge of material and process’ of Burfield Glove Makers and to Barrington Court’s Head Gardener. Somerset Art Weeks started out in 1994 as a biennial open studios event – one of the first five county-wide artist-led open studio initiatives after Oxford and Cambridge. In 2006 it had become so large that Somerset Art Works saw the need for an annual event that alternated between open studios and a curated festival format. “We have no gallery space in Somerset so therefore finding spaces to make and show work is very important in a rural county,” explains Carey. This year’s festival launches tonight with artist Tasha Tucker-Vallecillo‘s micro-tasting feast that continues the festival’s emphasis on celebrating locally-sourced produce and materials. Taking place in the Malthouse Gallery at East Lambrook Manor Gardens, it forms part of the second core curatorial programme for the festival entitled Abundance, which sees eight emerging and mid-career Somerset artists creating new site-responsive works for gardens throughout the county. Elsewhere, Alison Cockcroft and Kitty Hiller have installed works in The Walled Garden of Cannington and Leah Hislop’s installation is at Aller Farmhouse. Many of the projects have been supported by SAW’s ongoing programme Creative Pathways, established by Friends of SAW to provide bursary support artists with mentoring, go&see visits and making new work. Somerset Art Weeks Festival 2013 runs from 21 September – 6 October at multiple venues. 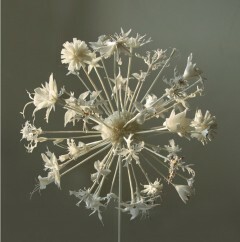 Pippa Koszerek is an artist and curator based in London. She writes for a-n News and is a-n's staff representative on the AIR Council. Pippa has been involved with artist-led activity since 1999 when, as a student, she founded the Independent Art School in Hull. In 2008 she initiated POST, a uk-wide network for artists and curators involved in site and context responsive practices. Follow her on twitter @pippa_koszerek.